Thank you. It is a joy and an honor for me to be here to celebrate this wonderful day with you and your families. 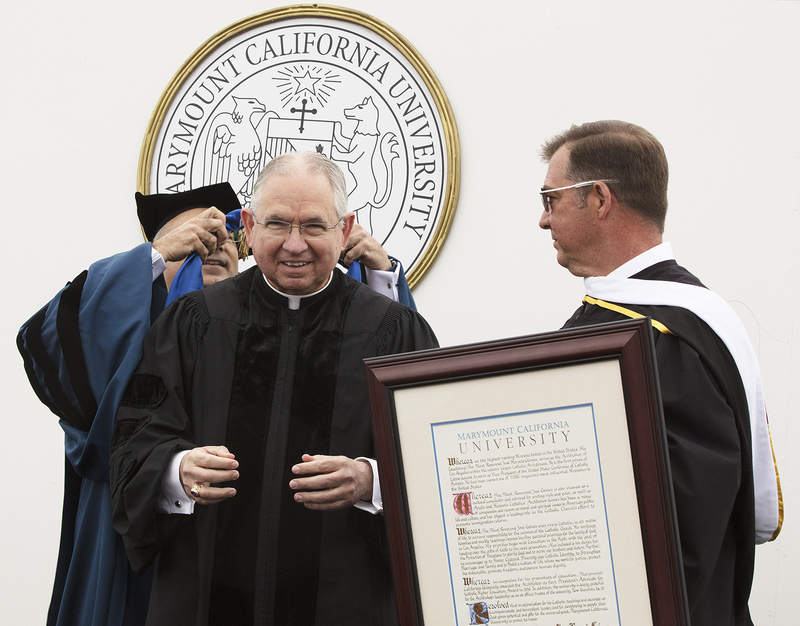 I would like to thank Dr. Lamadrid and the Board of Trustees of Marymount California University for granting me the Honoris Causa degree. It is an unexpected honor and a source of joy to be a part of the Marymount family. I’m happy that today I join the ‘Marymount Mariners”. So, thank you very much. On this beautiful day, my friends — you are graduating from a great Catholic university in a city that is named for God’s Holy Angels. That gives you some sense of your identity and mission after you graduate. It is amazing how many saints — have walked these same streets that we do; and watched the sun rise and the sun set from these same beaches and mountains. How many saints have served the poor here and done works of mercy and works of love. Of course the spiritual father of Los Angeles was St. Junípero Serra. I had the great privilege to be in Washington, D.C. in 2015 to celebrate Mass with Pope Francis when he canonized him. Our city has seen some “big name” saints — like St. John Paul II and St. Mother Teresa. But there are other saints who worked in L.A. who are not so well known — like the Cristeros refugees, Blessed Maria Inés Teresa and Venerable Mother Luisita. One saint who ministered here was St. Frances Xavier Cabrini. She is the patron saint of immigrants. In her letters about Los Angeles, she gives us beautiful descriptions of the land and the people. She also reflects on the deep divide between the worlds of the rich and poor. That was written about a hundred years ago! Maybe things have not changed too much, have they? It is still very expensive to live here, especially for the poor. My friends, my point is that you are now a part of this legacy — you now have the responsibility to build this “city of saints” in Los Angeles and in our world. You are called to build a city of saints in the midst of the secular city of humanity. This is the mission that the Religious of the Sacred Heart of Mary had in mind when they founded this great University. The reason for every Catholic university is to prepare students for life. But as Christians we define the meaning of “life” differently than others. We know that God does not grade our lives on a curve. The test of life has only a one-word answer. And that word is love. The saints teach us — that in the evening of our lives, we will be judged by our love. Did we love God and love our neighbor? Did we use our gifts and talents to spread God’s mercy and compassion in the world? Did we love kindness and do justice? You are graduating at a challenging moment in history. Think about this: You are about to enter a world where one Christian is being killed every hour, every day — just for the “crime” of believing in Jesus. So never take your faith for granted. You are entering an American society where every day you are going to be meeting and working with people who do not share your values; people who do not agree with you about how to live or what is right and wrong. How are you going to carry out your mission to be Christians — to love God, to build his Kingdom of mercy and compassion? How are you going to be saints in the heart of the secular city? In our time together this morning, I thought I would try to offer some words of advice as you enter this world. My first advice is this: Always remember that God matters in your life and your life matters to God. Sometimes I think we ask the wrong questions. We ask: What do I want out of my life? But life is not about us. The right question is — what does God want out of my life? Why did he make me? And the answer is that we are all born for greater things. We are made for God. We are made for love. The truth is that before God made the sun and the moon, before he placed the first star in the sky or started to fill the oceans with water — before the foundation of the world, God had a dream for your life and mine. A dream of love. This is not some beautiful idea that I thought up. This is what Jesus taught. This is the Gospel. Do you know the story of St. Josephine Bakhita? She was from Sudan. Africa. At the age of nine she was kidnapped by human traffickers and sold into slavery. But in her suffering, St. Josephine discovered Jesus. And once she did she was truly free. It took years before she was physically set free. But in those years, she knew hope and joy — even in suffering. She knew where her life was going. And this made all the difference. So my friends, my advice is this: No matter what happens to you in life, or wherever you find yourself — remember that you are loved. Remember that your life matters to God. Then follow his path with all your heart. Love what you do. And do what you do — all for love. All for God. That leads me to my second word of advice. I got this from a cab driver in Washington, D.C. earlier this year. What a beautiful thought, isn’t it? In every moment we have the chance to serve God, and to love God. In the people we meet. In the things that happen to us during every day. In every moment we can do good — and our life will be good. Jesus said we find our lives by losing our lives. The road to happiness always leaves selfishness behind. We gain everything — when give everything away. It is a beautiful way to live. And you should make it your way, my friends. So these are some thoughts for you as you set out on your journey. I am praying for you on this important day. Let me finish with one brief story. I mentioned St. Frances Xavier Cabrini at the beginning of my talk. I used to be a bishop in Denver, Colorado. And there is a mountain in Denver where Mother Cabrini left a beautiful relic. One day, she took some of her orphan children to the top of the mountain and they gathered hundreds of white stones of all different sizes. And they worked all day to arrange them into the shape of a large Sacred Heart of Jesus. It’s still there — you can check it out. That’s a good prayer for all of us on this graduation day. Let us ask God to give each of us — a heart as big as the universe. So that we can love God and do good for others. So that God may use our lives — what we have learned and all our talents and passions — to spread the love of God. To build the city of saints, in the heart of the secular city of humanity.